You expect the best of your employees and believe they can deliver – that’s why you hired them after all. Unfortunately, even the finest worker can be guilty of misconduct given the right set of circumstances, needs, pressure, or frame of mind. When you require proof that the actions of a valued employee are damaging your company, rely on the experienced private investigators at ASG to conduct a thorough, confidential employee misconduct investigation. An employee’s bad behavior often requires far more than a warning to cut it out. You may need to take legal action against a worker who has become a disruptive liability or a financial threat. The last thing you want to do is shake up the work environment you have carefully cultivated by confronting an employee without solid evidence. Working with a private investigator ensures that you have the information you need to move forward with your situation without interrupting daily operations at your business. Sexual harassment: Unwanted advances, inappropriate comments, offensive jokes or stories, obscene photos – any situations that make an employee feel unsafe and uncomfortable can constitute sexual harassment. Physical harassment: Assaults and threats of violence against employees within the workplace is far too common. Physical harassment can include sexual assault and aggravated assault. Verbal harassment: There is a difference between being a tough boss and verbally attacking peers or subordinates. Threats and intimidation can fall into the category of verbal harassment and disrupt a safe working environment. Bullying: Humiliation, criticism, a raised voice, gossip, false accusations, sabotage, exclusion, stolen work, and more can all be considered bullying in the workplace. You’re paying an employee to do a job for you. Their time, essentially, is yours. They may be guilty of emailing or texting more than they should, but far more costly and egregious examples of time theft happen when an employee is out of the office and away from direct supervision. Instead of working at home, an employee may spend the day working another job to earn another income, or use work time for personal needs, like shopping, relaxing, or sleeping. A company’s assets include not just financial information but also trade secrets, intellectual property, and proprietary information. Employees in big and small businesses alike have been caught committing employee asset misuse by borrowing or taking company funds or equipment for personal use, accepting gratuities in exchange for perks or special treatment, or using the company’s assets for competing business transactions. Theft, unfortunately, is common in business and often appears as falsified wages. Payroll abuse happens in a department where you must unequivocally trust the people handling your company’s dollars and cents. Some thieves inflate the hours they or another employee (accomplice) has worked to get a higher paycheck. Sometimes paychecks are simply increased with no obvious reason. Some instances of payroll abuse have people creating ghost employees who don’t exist but receive a paycheck anyway. It’s almost always obvious when an employee is suffering with substance abuse. Getting proof of the problem with the help of a private investigator is essential so you can show that the employee’s activities and behavior are impacting their job performance. Substance abuse – whether alcohol, drugs, or even tobacco – can be grounds for dismissal. Insubordination can be difficult to recognize and to prove. There are employees who are flat-out defiant, while some simply disregard or ignore the instructions they have been given in a more passive example of disobedience. Insubordination can happen between a company and an employee or a superior and an employee. All instances of insubordination can brutally damage an enterprise. Not every employee is perfect. They shouldn’t be expected to be perfect. However, there are rules and regulations that employees agree to follow when entering your employ. If you suspect that one of your trusted workers is guilty of employee misconduct, contact ASG Investigations to begin a confidential, undercover surveillance of their behavior. Your company’s reputation and bottom line are at risk. 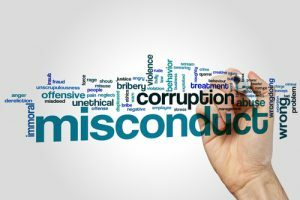 Allowing any possible employee misconduct to continue is putting your organization at risk. Contact us today to schedule your consultation and find out how we can help with a specialized, customized investigation about your sensitive matter.